Size of this preview: 417 × 599 pixels. Other resolutions: 167 × 240 pixels | 334 × 480 pixels | 418 × 600 pixels | 535 × 768 pixels | 713 × 1,024 pixels | 1,596 × 2,292 pixels. 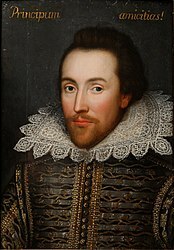 Lëtzebuergesch: Uelegporträt vum William Shakespeare am Alter vu 46 Joer, gemoolt 1610 zu Liefzäite vum Dichter, haut am Besëtz vum Konschtrestaurator Alec Cobbe. Русский: Возможно, прижизненный портрет Вильяма Шекспира, хранящийся в семье Коббе. Location England, Wales and Northern Ireland. Historically, the trust tended to focus on English country houses, which still make up the largest part of its holdings, but it also protects historic landscapes such as in the Lake District, historic urban properties, and nature reserves. it is an anonymous work, a pseudonymous work, or a work made for hire, and it was created before 1899. The above provisions are contained in 17 U.S.C. § 303. See also this page for more information.